California residents: If you're struggling with debt and less than perfect credit, you might be tempted to take out a personal loan, debt consolidation loan, or even a payday loan. However, it's important to know that having bad or poor credit can typically result in very high interest rates. Many people feel that debt consolidation loans for those with bad credit can seem like a quick fix to a debt problem, but many lenders who offer these high interest rate loans to consumers with bad credit have been cited for taking advantage of consumers via "predatory" practices. For this reason, it's important to be fully informed before you agree to these expensive loans – which could quickly make your debt predicament go from bad to worse. It's important to be careful when a lender offers a bad credit loan or even a bad credit debt consolidation loan; it may be a high interest rate debt consolidation loan, personal loan, or even a dangerously high interest payday loan. Again, if you have bad credit and are attempting to get out of debt with a loan that comes with a sky-high interest rate, be cautious before moving forward. Instead, if you are experiencing a financial hardship or falling behind with credit cards and other unsecured debts such as medical bills and department store bills, it's wise to explore alternative debt relief options. One popular debt relief option is called a debt management plan or a DMP, where the goal is to combine, or consolidate, multiple high-interest consumer debts into a single, more manageable payment each month. Through the benefits of debt relief such as lower interest rates and the waiving of late fees and penalties, a DMP can provide provide personalized assistance for consumers who need a proven and more predictable path out of debt. 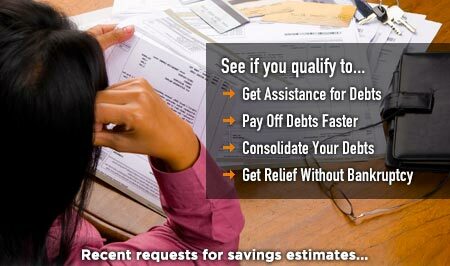 To see how debt relief can help you, take a moment to answer a few simple questions online and receive your free debt relief analysis and savings estimate. These days, it's common for consumers who are struggling with personal or financial hardship to search for any and all options to ease their pain for the moment. However, understand that no matter how difficult finances may be, bad credit loans will likely put you much deeper in debt. This is because high interest rates can quickly take your debt burden much higher, thus creating an even more vicious cycle of debt that becomes harder and harder to escape. Even when monthly payments seem low and affordable, the terms of a bad credit loan or poor credit debt consolidation loan may be so long that you are "financing" your "recovery" by paying more money than you ever imagined. 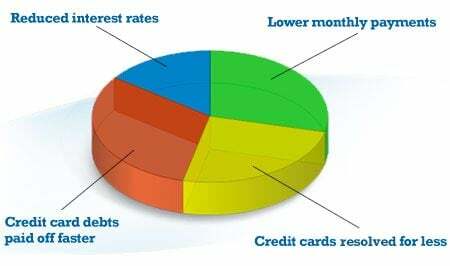 It's a fact of life that one of the most lucrative markets for lenders is the bad or poor credit sector, because lenders understand that those with bad credit are among the most desperate of borrowers. This is why offering bad credit loans is such a big business, where lenders generally get rich via predatory interest rates, taking advantage of one's desperate financial situation. California residents are wise to avoid these types of loans by building good spending and budgeting habits, paying down high interest credit cards if at all possible and looking at popular debt relief options such as a debt management plan through credit counseling, debt settlement, or even bankruptcy. These will help you take control of your finances so you can finally get off the debt treadmill. Whatever you do as a consumer to turn things around, know that people all over the country have experienced high credit card debts and financial or family hardship. Rather than be mired in guilt, just know that the first step you take to put the cycle of debt behind you could be the best thing you ever do for you or your family's financial future. If you are needing assistance beyond debt relief programs for more immediate relief, such as help paying for utilities, rent or even buying groceries, the state of California has a variety of financial assistance programs available, such as the Food Assistance Program (SNAP), Medicaid, and the Low-Income Home Energy Assistance Program (LIHEAP). To learn more about these services, go to the state's homepage and click on the Benefits page. The bottomline is, if you are experiencing a financial hardship and are struggling with credit card debt, there are several debt relief options that can help you resolve your debts and help you get back on track. Take a moment to answer a few simple questions online and receive your free debt relief analysis and savings estimate from a BBB-accredited (Better Business Bureau) debt relief provider.